Which Halloween Candy Should You Avoid? It’s that time of year again. The leaves are changing, the days are getting shorter, the temperature is dropping, and Halloween is fast approaching. Traditionally, Halloween is one of the most popular holidays that is celebrated in the United States. 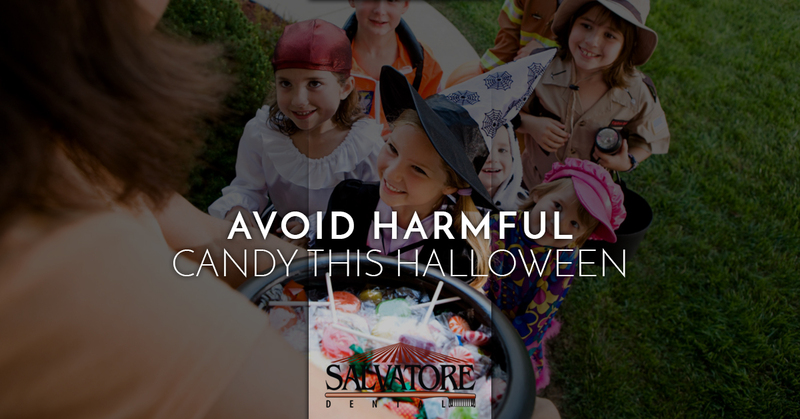 While some people may argue that Halloween’s popularity is due to its spooky nature and the costumes that are involved, we here at Salvatore Dental believe that the free candy has more to do with it than anything else. Unfortunately, as a Malta area dentist office, we are also keenly aware of the negative effects that candy can have on a person’s oral health. In today’s post, we thought it would be useful to cover some of the worst candies for your teeth so that, hopefully, you will avoid these treats come October 31st. Continue reading below to learn more. In moderation, candy isn’t exactly terrible for your teeth. However, at the rate that people eat candy during Halloween, even the most diligent brusher can cause damage to their teeth. Below, we have listed some candy that you should try to avoid. Sticky/Chewy Candy: Candy that is particularly chewy or sticky is pretty bad for your teeth. Unlike other substances that are washed from the mouth due to natural salivatory action, sticky and chewy candy gets stuck in between the teeth much more easily. This allows the bacteria in the mouth to feast upon the sugary goodness for longer, allowing them to release a lot more acid than they normally would. Sour Candy: Sour candy is bad for two reasons. First, sour candy is full of sugar, sugar that the bacteria in your mouth love to eat. Second, sour candy is usually given its sour flavor by a healthy coating of acidic artificial flavoring. The acid found on the candy coupled with the acid that mouth bacteria naturally make works together to cause quite a bit of damage to the enamel of your teeth. In our opinion, sour candy should be avoided at all costs. Hard Candy: It’s unfortunate that hard candy is as bad for your teeth as it is because it is one of the most popular types of candy available on the market. Hard candy is so harsh on your teeth not because of the sugar content (although that is a factor) but because of the length of time that people tend to keep hard candy in their mouth. Hard candy has to be sucked on for a few minutes before most people are able to chomp down on it. Keeping the candy in the mouth for this long works to coat the teeth in a large amount of sugar. As we stated above, this sugar gets transformed into acid by mouth bacteria, negatively affecting the enamel of your teeth. Thank you for reading our short blog on the most harmful types of candy that you are likely to encounter this Halloween. Additionally, if you would like to learn more about the dental services we provide or you would like to schedule an appointment at our Malta office, please get in touch with us today at Salvatore Dental and schedule an appointment.